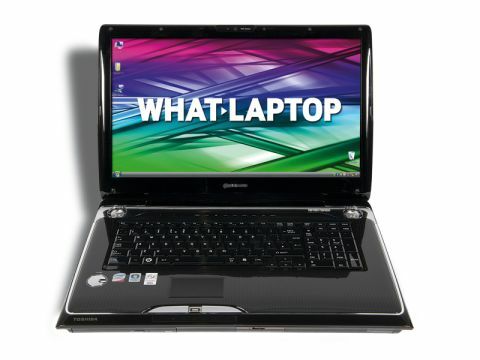 Has Toshiba struck a balance between laptop performance and budget? The Toshiba Qosimo G50-127 is a large media centre that offers good value for money, although its rather garish design and sheer size might put some buyers off. The 18.4-inch screen is bright and detailed, so movies look fantastic, although the 1680 x 945-pixel resolution doesn't challenge the full high-definition displays used by Sony and other manufacturers. The use of a Super-TFT screen coating also means that reflections can be irritating in bright light. A powerful Nvidia GPU has been used, with 512MB of dedicated video memory, and we found this laptop ran the latest games without any problem. As with most of the Qosmio range, the keyboard is a mixed bag. The action is smooth and comfortable enough to use for long periods of time, but the board is a little spongy and a few of the keys actually squeak when you strike them, which is a surprise at this price point. Considering the laptop's size, the touchpad is a little small, but it suffices nonetheless and the mouse buttons are large, stylised and responsive. The chassis' design will attract and repel in equal measure, as will the lid. Glossy black and silver plastics have been implemented with a lined pattern, which gives the laptop a garish look that doesn't really reflect the asking price. Speakers from audio specialist Harman Kardon are built in and enhance the audio experience. A line of hotkeys also let you access multimedia applications with ease and offers great functionality. At 4.8kg, this is not the most portable machine, but the impressive 238-minute battery life will provide you with plenty of freedom on the go should you ever need to move around. Internally an Intel Core 2 Duo processor powers the machine and is combined with 4096MB of memory for fast office performance. You'll have no problems running resource-intensive software, such as photo, movie or music editing suites. The 320GB hard drive isn't the most capacious around, but will provide room for any large applications, music and photos you may want to carry with you. Unfortunately, there's no Blu-ray drive and you'll have to make do with DVD quality, but a digital TV tuner is included for watching TV on the go. Connectivity is excellent, with 802.11n Wi-Fi and Gigabit Ethernet both present. Mini-FireWire and HDMI ports are also included alongside four USB interfaces. The Qosmio G50-127 is a good option for those after a powerful laptop that won't break the bank, but if you're after true performance and can afford the price, we'd recommend looking elsewhere.